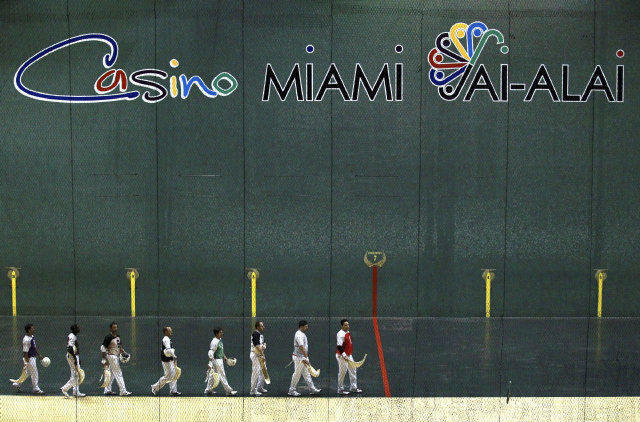 Jai-Alai players prepare to play a game at the once cultural icon in Miami, Aug. 22, 2013. The Jai-Alai fronton declared bankruptcy earlier this year. Despite the financial restructuring they will continue to entertain with Jai-Alai, concerts, and gambling. Its second-quarter earnings report, showed Florida Gaming posting a $4 million operating profit for the three months that ended June 30. Casino revenues in those 90 days hit $19 million. Tellez said it used to be so loud in the stadium that you couldn’t even hear the ball. Now, the sound of that pelota hitting the wall at 180 miles per hour echoes throughout the empty arena. Bartender Manny Rodriguez has worked at the arena for 35 years, or half his life. The restaurant is now closed. The chairs are stacked on top of booths, where celebrities like Sylvester Stallone, Frank Sinatra and Gloria Estefan once ordered steak dinners. Daniel Michelena came from France to play Jai-Alai in Miami. He won a world championship and ten triple crowns. Now he’s a manager at the arena. He says Miami Jai-Alai had the best fronton in the world. On the biggest nights, the betting handle got up to a million dollars. Today, he says, it tops out at around $60,000. In the late 80s and early 90s, Miami got the Heat, the Marlins, the Panthers and the Florida Lottery and Jai-Alai lost its hold. Then two of Jai Alai’s former executives were violently murdered in connection with recently convicted Boston mobster Whitey Bulger. The neighborhood became more violent, as bands of robbers began targeting tourists. Now, maintaining Jai-Alai matches bring a loss of a million dollars a year. But having Jai-Alai there allows the company to operate a casino - which opened 2 years ago, and brings in a million dollars a week.